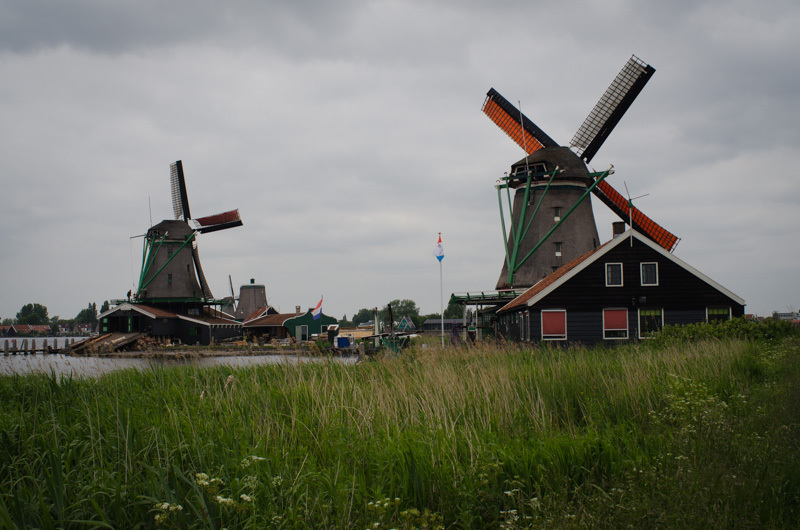 My parents had recently taken a cruise through the Netherlands and had mentioned one of their favorite sites was the windmills of Kinderdijk. It was fascinating listening to them talk about how the Dutch have reclaimed land from the sea with the use of windmills. After hearing about Kinderdijk and learning that it was on the UNESCO World Heritage Site list, we put this on our must see list. 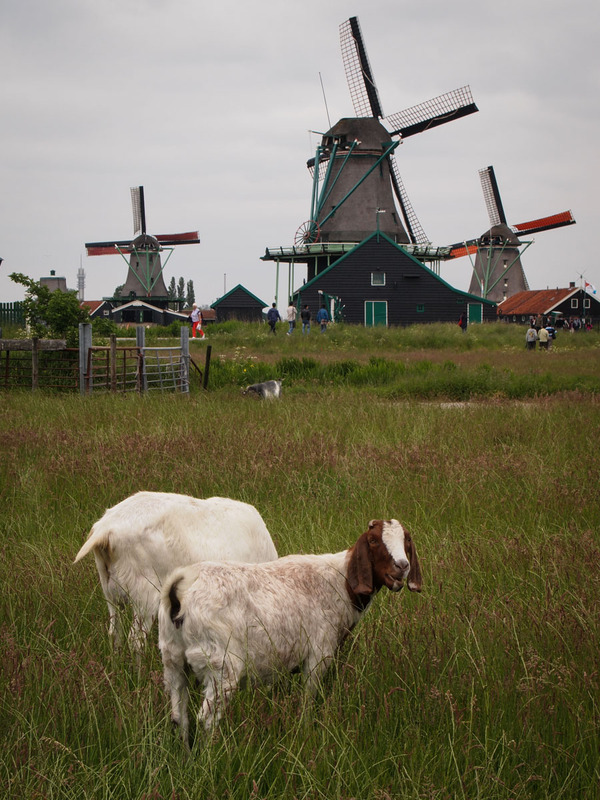 After all, who can go to the Netherlands without seeing windmills? After further research, we unfortunately realized that we did not have enough time to see the windmills and I was preparing myself for disappointment. 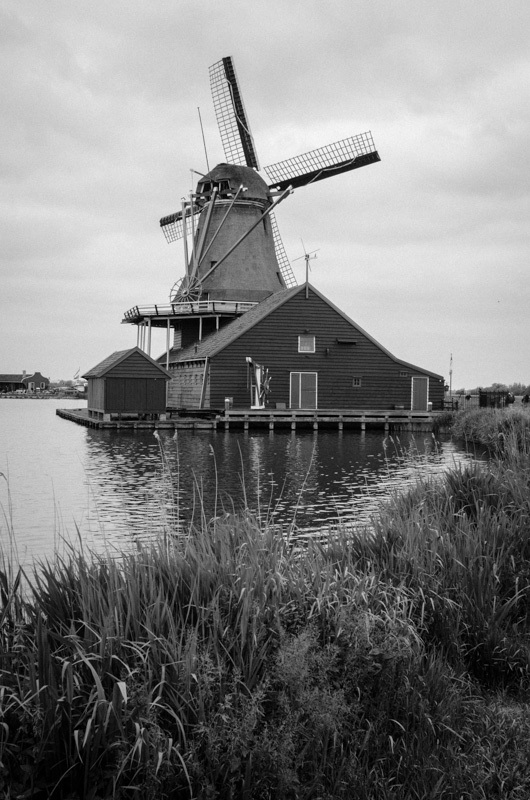 Then the person who was renting the house to us in Amsterdam suggested an alternative, Zaanse Schans. We googled it and the pictures made it look intriguing enough to go and check out. 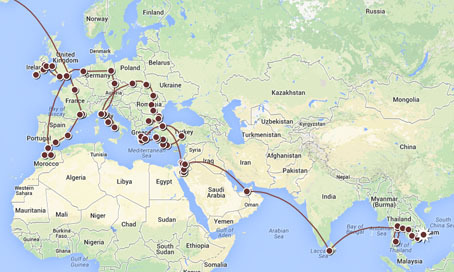 The best part though it was only a relatively short bus ride from the city center of Amsterdam. On the day we decided to go, we easily found bus #91 located next to the train station. Before stepping on we verified with the bus driver that indeed we were on the right bus and it would be the last bus stop on the route. However, when we reached our bus stop we were hesitant to get off. A parking lot filled with tour buses and a building that looked like a shopping center lay before us. Could this possibly be it? Where were the windmills that I had seen in the pictures? I was bewildered. Surely this was not the stop? The bus driver politely prompted us to get off explaining that indeed it really was the stop we wanted. My heart sank as I eyed the parking lot full of tourist buses. I kept on thinking what have I gotten us into and I was starting to feel really bad. 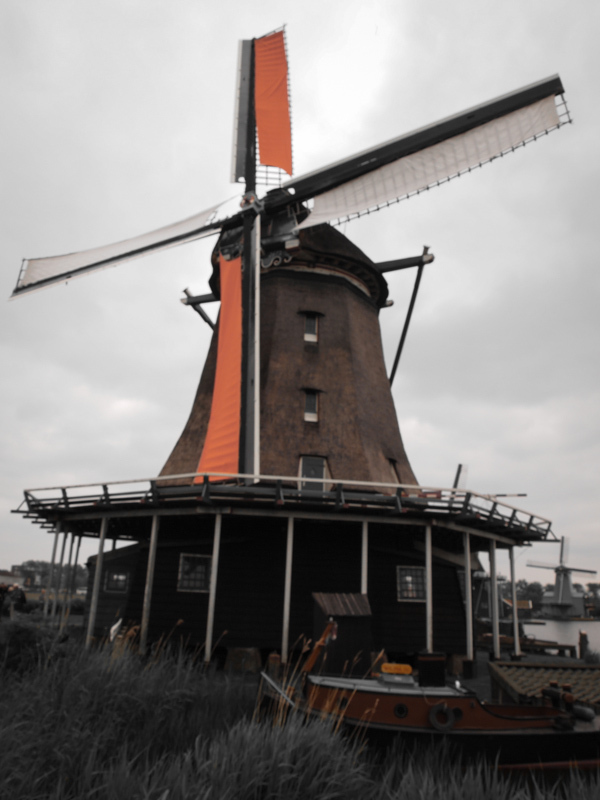 After all, it was I who had really wanted to see the windmills. As we made our way across the parking lot, the windmills gradually came into view. However, I was not reassured by the view as we were herded through a turnstile and our picture was taken. Every nerve in my body was screaming tourist trap! Part of me wanted to run away screaming. 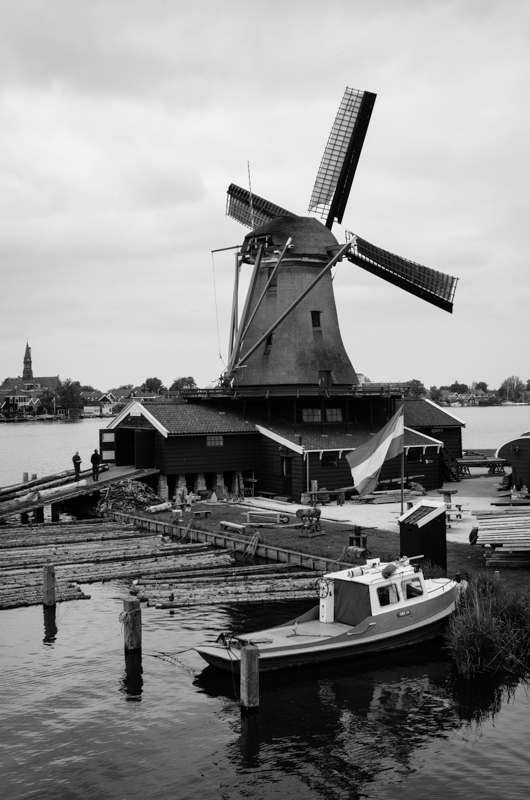 Reluctantly though I decided since we had made the effort to get to Zaanse Schans, we should at least give it a chance. As we made our way down the streets packed with tourists and lined with over priced restaurants and souvenirs shops, I kept on thinking at least we did not pay a lot for the bus ride out here. I also thought that under absolutely no circumstances would we be sucked into buying anything here. Well… I have a confession to make now. 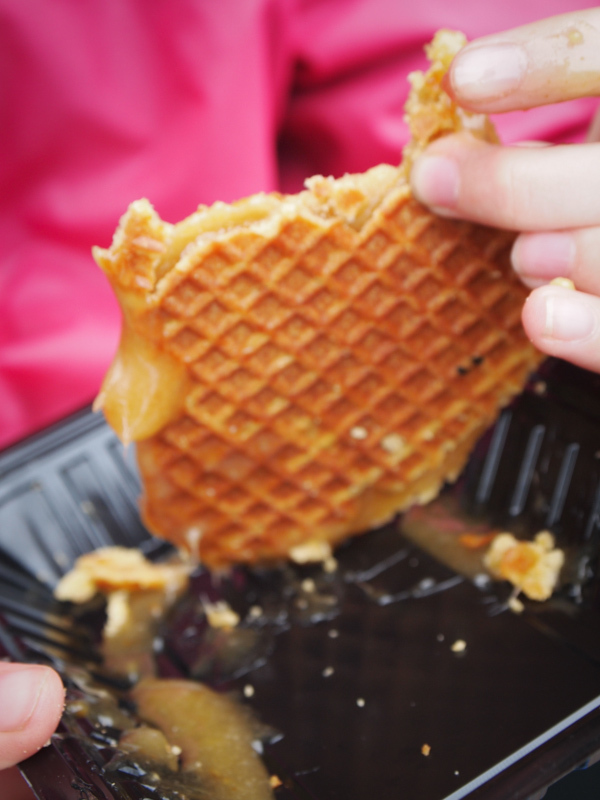 My resolve rapidly crumbled when Sydney spotted the hot gooey stroopwafles. Though the fresh stroopwafles cost a small fortune they tasted oh so good. 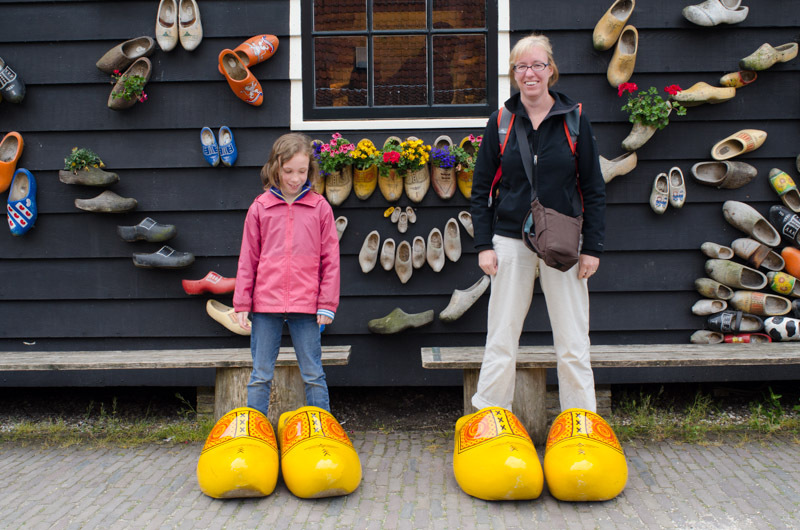 Dodging other tourists, we slowly made our way towards the windmills when we noticed a couple pairs of gigantic clogs. What the heck I thought, let’s get some cheesy photos. We then noticed the free Clog Museum and decided we would take a peek inside. Following the line of tourists inside, I began to find that I was enjoying myself. The free Clog Museum actually turned out it to be interesting. The Clog Museum had a nice display of clogs from over the ages and provided a little history about the clog. 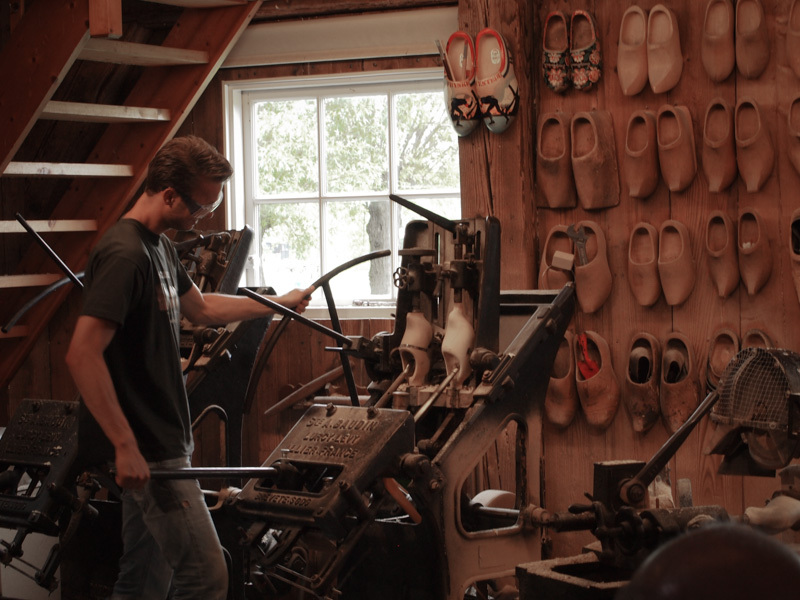 Did you know that the groom used to carve ornate clogs for the bride? While wandering through the museum we got to see how they used to make then and how they are made today. After the demonstration we then had fun trying on and modeling the different clogs. They were surprisingly comfortable. I was tempted to buy a pair when my husband Jason reminded me how much our bags already weigh. Saying goodbye to the Clog Museum, we set off once again to the windmills. 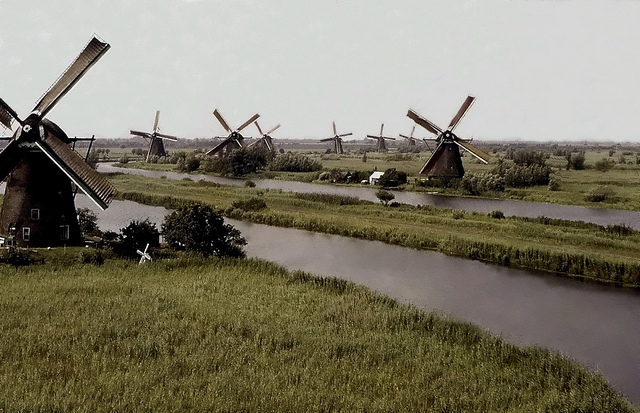 The windmills are set along the River Zaan and several fields lay behind them giving them the look of remoteness in pictures seen on the Internet. 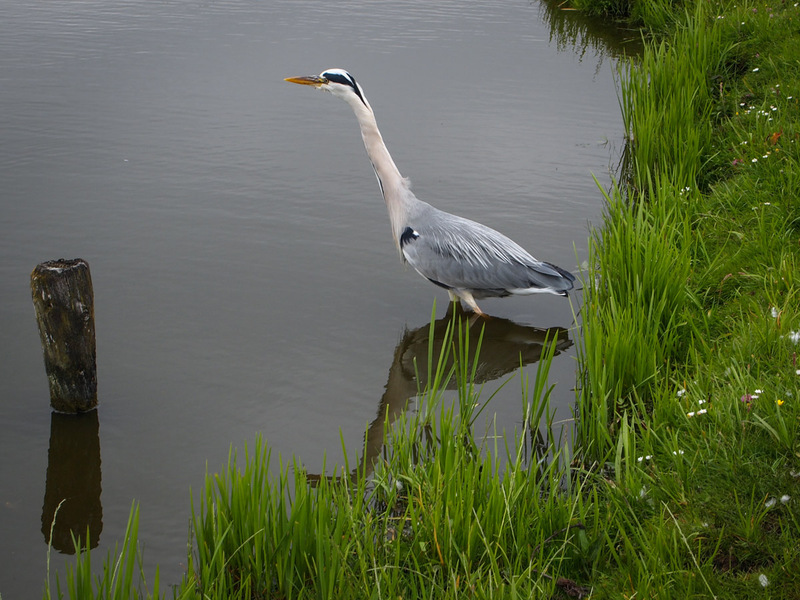 Surprisingly, despite the crowds as we made our way to the windmills, we saw several blue herons and even saw one catch a fish. 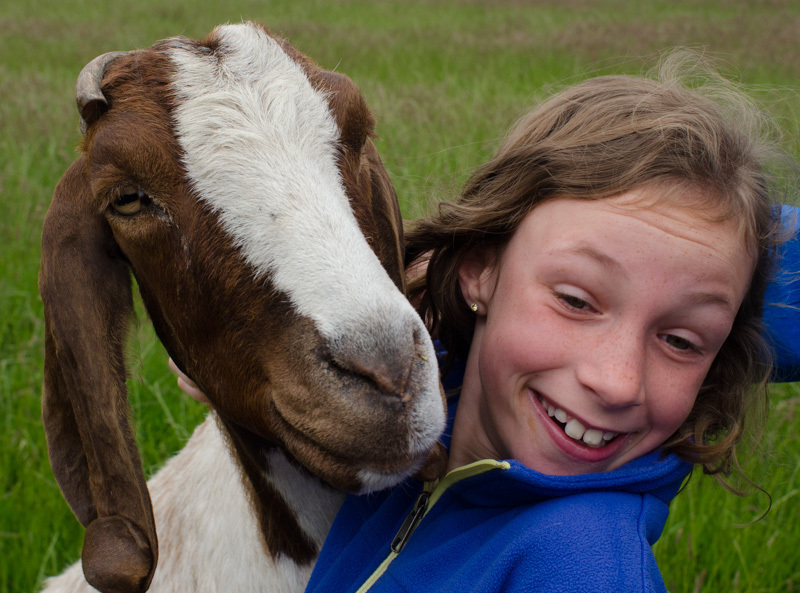 Sydney also made a friend with a very curious goat. We then realized several of windmills had sails on them and were actually working. Curious, we stopped in front one of the windmills and noticed that we could go in for a small fee. Never being in a windmill before, we decided to pay the fee. Our timing couldn’t have been more perfect. A large tourist group came in right after us and the owner proceeded to give a tour of his windmill. 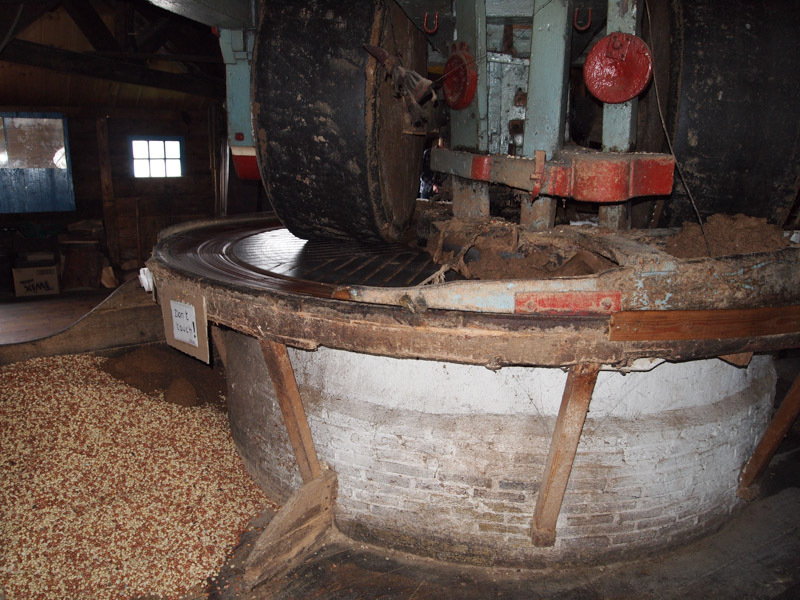 His windmill currently makes peanut oil and it was fascinating to see the how the inner gears of the windmill work, learn how peanut oil is produced, and what happens to the left over crushed peanuts. Did you know that they use the leftover crushed peanuts as feed for cattle during the winter months? 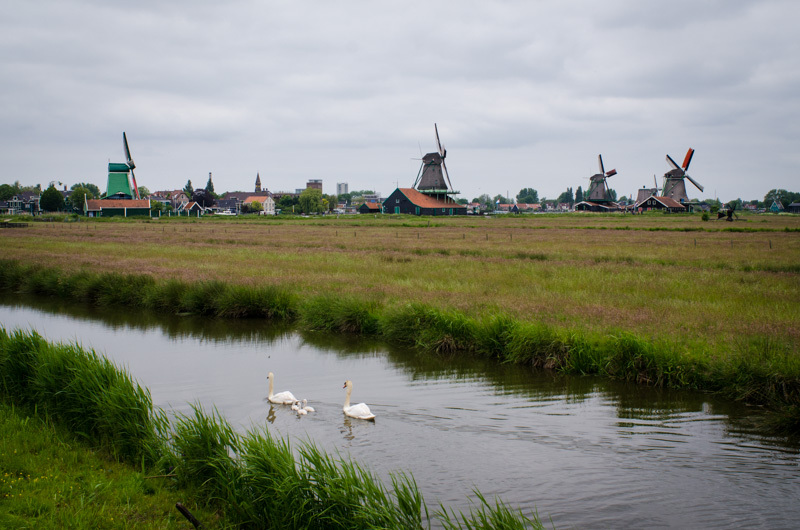 Though my first impression of Zaanse Schans was that of a tourist trap, in the end I am glad that we made the effort to go. I learned a little more about the Netherlands and we had a fun day out.